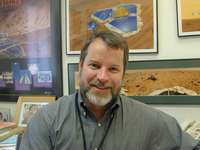 Rob Manning led the team responsible for entry, descent, and landing of NASA's Mars Exploration Rovers on Mars. At times during the Mars rover mission, the tension was palpable even as far away as NASA headquarters in Washington, D.C. This was especially true about 18 months before launch, when the airbags that cushioned the landers began tearing apart during testing, and again about a year before launch, when the parachutes failed. "When your whole $800 million project is riding on something," said Rob Manning, "you have to stay calm, stay focused." 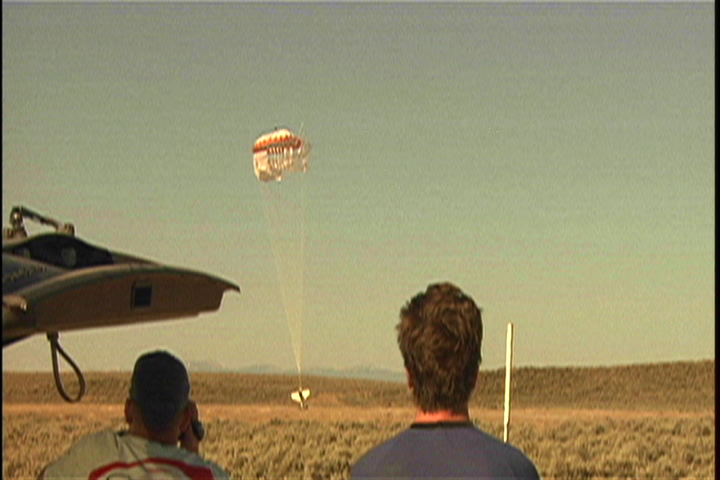 Manning's team was responsible for the entry, descent, and landing of both rovers on Mars. "You really need people who have the sense, ‘I can make this happen.'" 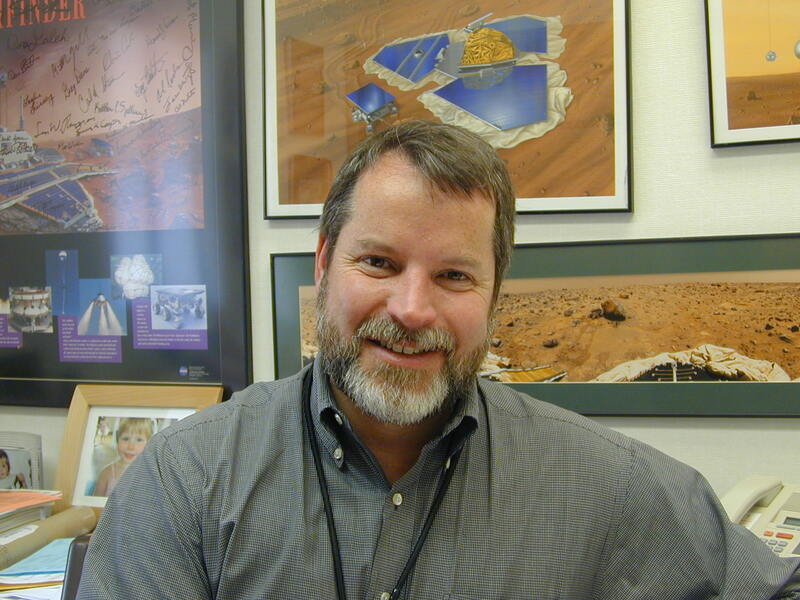 As chief engineer for the Mars Pathfinder mission in the 1990s, Manning was used to keeping the foot on the accelerator even while making adjustments. But when the parachutes started ripping apart, even Manning was surprised. In the beginning, the airbags intended to land the rovers safely on Mars shredded during testing and had to be redesigned. View a video about testing and designing the airbags. 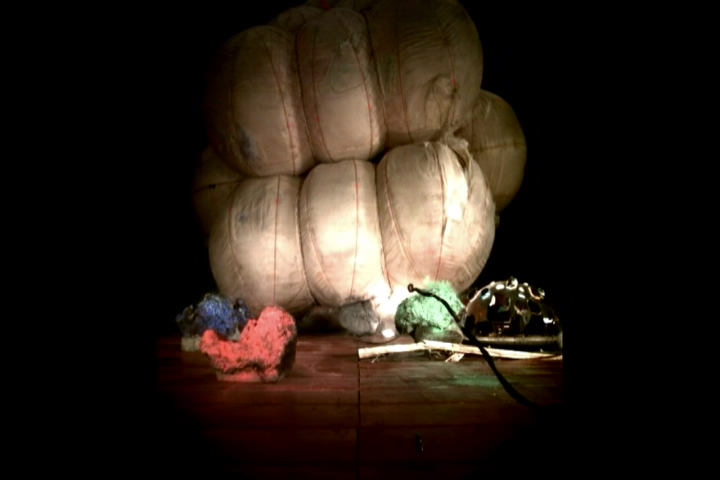 View a simulation of the airbags being deployed on Mars. No one expected either the airbags or the parachutes to fail because they were the same as those that successfully landed the Pathfinder lander and Sojourner rover on Mars in 1997. But the extra weight of the beefed-up Mars Exploration Rovers put too much strain on the original designs. Team members could have driven a car through the holes that appeared in the fabric as a result of increased stress during testing. During other tests, the parachutes responsible for slowing the rovers down as they dropped to the surface of Mars tore to pieces while engineers gasped. For a while, it seemed the mission might be doomed unless they could figure out why the airbags shredded and the parachutes fell apart. Several tests later, engineers got the idea of doubling the airbag strength by putting a smaller airbag inside the outer airbag, like an inner tube inside a tire. That idea didn't work at first, but it led them to try doubling the interior air bladder inside the airbags. It seemed they had a solution. Soon, they also had a successful parachute flight, after changing the materials and skeleton of the chutes to make them stronger. During flight testing, the first parachutes employed to carry the rovers to the surface of Mars also failed and had to be redesigned. View a video animation of a parachute landing a rover on Mars. 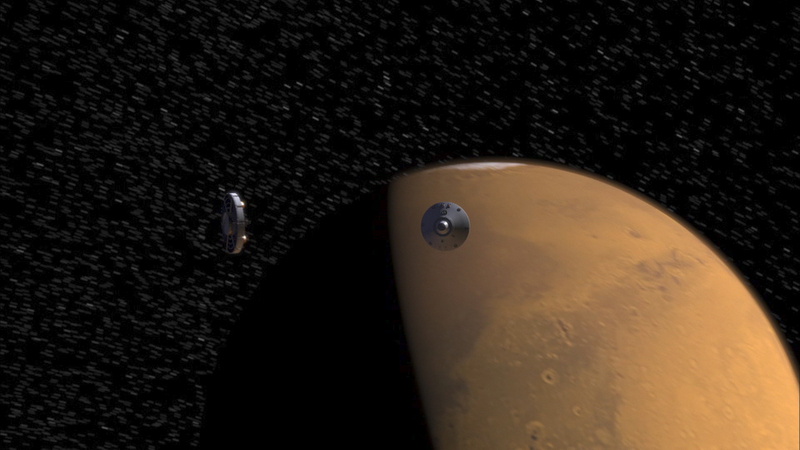 To view a full-length video about Entry, Descent, and Landing on Mars, click here. Unfortunately, these modifications also made the parachutes bigger, which meant they wouldn't fit inside the fixed-volume parachute canisters on the spacecraft. When the team built and tested smaller chutes in a wind tunnel at NASA's Ames Research Center, the chutes failed to open. Instead, the chutes fluttered in mid-air in a phenomenon known as "squidding" – reminiscent of the fluttering of a squid's fins as it swims through water. After more discussion and design modification, engineers fixed that problem, too, by adjusting the size of the vent that allowed air to flow through the chutes. It turned out that because the chutes were stuffed into a smaller space, they were much denser and didn't float through the air as before. The team made the chutes smaller for better fit, and sewed them from thicker, stronger material. 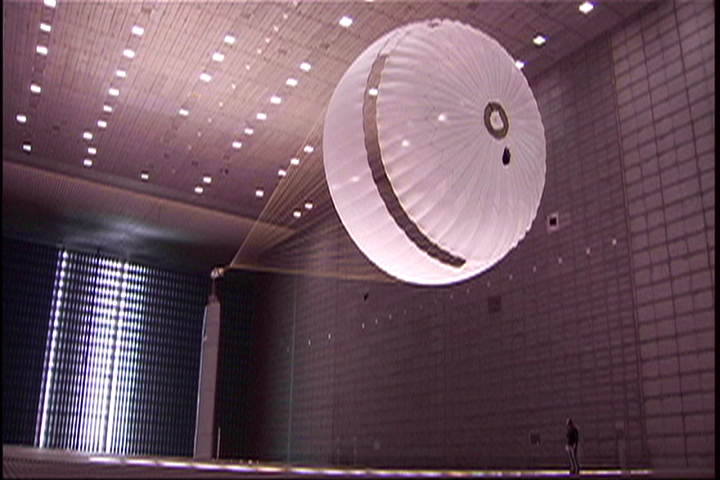 After adjusting the size of the vents and changing the materials used, engineers got a successful parachute test at NASA Ames Research Center. All in all, it was a frantic several months of unsuccessful tests, modifications, more unsuccessful tests, and more modifications, as the clock ticked and time ran out. Engineers, scientists, technicians, and managers worked day and night getting everything right. The rovers were finally lifted into space from Cape Canaveral, Florida on June 10 and July 7, 2003. Still, the most unearthly challenges were yet to come. Some things would have to be fixed after the rovers were no longer on Earth, but millions of miles away. Engineers made a final fix to the computer codes just hours before the first Mars rover landed on the surface. In December 2003, about a week before landing on Mars, one of the engineers testing the entry, descent, and landing software discovered that the airbags didn't inflate and the rockets intended to slow the rover's descent failed to fire. The team had run similar tests hundreds of times and the rockets had fired perfectly. Of course, all of the hardware on the spacecraft only works in response to computer commands. So they ran a computer simulation of the spacecraft landing using one of the four rover models remaining on Earth. In three tests just before landing on Mars, the rover model forgot to fire the rockets. The team didn't know if it was a hardware or a software problem. Four days passed before the test results came in showing that the rockets had not fired because of subtle differences between two clocks used in one of the Earth-bound rover models compared with all the others. This timing difference was also present on the real rovers screaming toward the surface of Mars! Even though this rover hadn't been used very much and there appeared to be only a small chance that the Mars-bound rovers would crash into the planet, those odds were still too high for comfort. "Of course," reflected Manning, "now we had to explain it to people like (JPL Director) Charles Elachi and NASA, who were very curious about this." Engineers on Earth fixed the computer codes manually to synchronize the clocks. Three and a half hours before landing, they sent a new set of computer commands to Mars. On Jan. 3, 2004, the first rover, Spirit, landed safely to the ecstatic applause of engineers, scientists, NASA officials, and Red Planet watchers around the world. Again, the Mars rover team was off and running. And again, their problems were far from over.